Nvidia CEO predicts "supercomputing everywhere"
Nvidia's CEO Jen-Hsun Huang fronted "a rollicking event," to mark the start of the SC15 conference in Austin Texas. The key message the large crowd took away from Huang's presentation was that supercomputing is being accelerated by the adoption of Nvidia GPUs and that this very same technology will become widespread in seemingly disparate industries such as transportation and robotics. Huang started by saying that "Supercomputing technology is in the process of extending well beyond supercomputing itself". He foresees the same GPU tech behind the latest growing trend in supercomputers, powering cloud computing, complex simulation and visualisation, to become integral to emerging growth industries like autonomous cars and personal robot assistants. 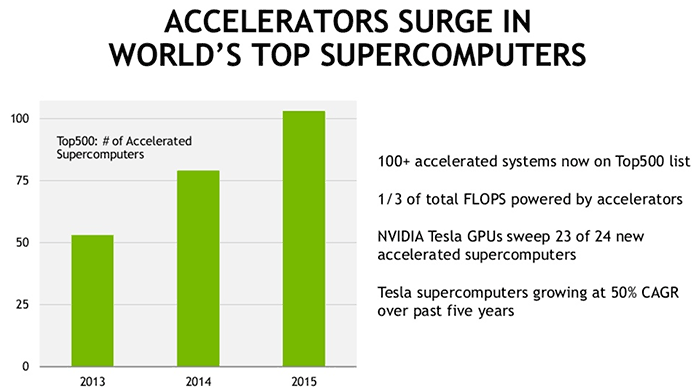 Nvidia's CEO claimed that the use of GPU accelerators in supercomputers in the top500 list is growing nearly 50 per cent annually. Nvidia owns better than two thirds of this market. 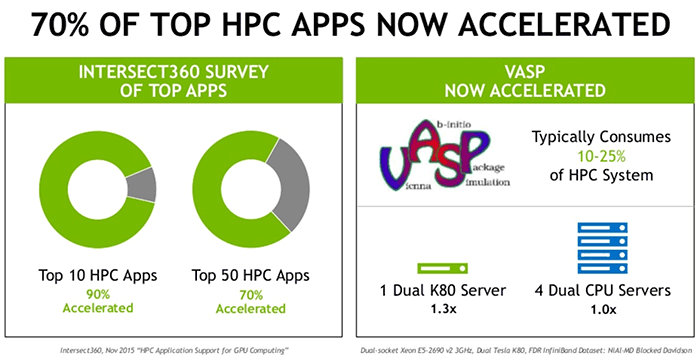 Behind the trend in GPU acceleration take-up is the slowing of Moore's law, the growing number of important HPC applications that are GPU accelerated and the price to performance benefits of adding GPU accelerators, claims Nvidia's Huang. In the future machine learning will increase demand for GPUs even further. Machine learning is "high performance computing's first killer app for consumers," thinksHuang. This technology allows technology to become autonomous in the complex real world and will be instrumental to the production of autonomous vehicles and machines such as personal care robots. The Nvidia CEO remembered to plug some recent Nvidia products and mentioned the recently introduced Tesla Hyperscale Acceleration line for data centres, the Jetson TX1 module (said to enable machine learning for portables), and the Nvidia Drive PX car computer and sensor system. soon you will not need core i3 to run windows just intel HD graphics will be the minimum requirement! ………. OPEN CL all the way!